I'm going to take a look at Iran for this update! I know it has been a while since the last update, please forgive me as I have been VERY busy. I don't think that Iran will bomb Israel seeing as the world is growing weary of Iran's antics; quickly. With that said though, the leaders of Iran have been sponsoring terrorism and attack America (and Saudi Arabia) whenever it can. If we keep that in mind Iran could close the Strait of Hormuz or start a wave of terrorism the likes of which we have never seen. With the new attacks on Israeli diplomats in India and the attempted attack in Georgia the situation doesn't seem to be getting better. Iran isn't as suicidal the Arabs are, they will blow themselves up but they have a well organized and equipped military which reduces the need to blow themselves up (as much). Iranians ARE NOT Arabs nor are they SUNNIS they are Shiites and hate the Arab world more than the Jews (possibly). The people of Iran are Persian and speak Farsi and their culture is similar to Arabia but not of it you can't treat or think of them as Arabs they are a unique people who need a unique solution. We need to remember that the Iranian people don't want to be under their current government. But an attack by the West would unify everyone in Iran against those who attacked. 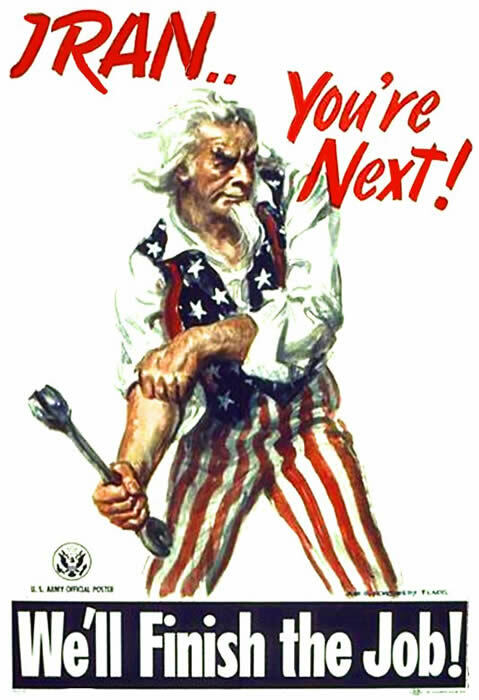 If somebody attacks your country you are going to fight back, what we should be doing is helping to instill revolution in Iran at breakneck speed; Obama really missed his chance in the "Green Revolution" in 2009. If Obama had rallied the international community as the US, France, and the UK did against Libya something may have come out of it. This happened in Libya and is starting to happen in Syria, Iran's only ally in the Middle East, cut off this ally and start closing in on Iran. Though it should be noted that Libya and Syria are part of the Arab Legate; Iran isn't. What many people may not know is that the Arab nations are scared of Iran; they liked having Saddam as a bulwark against Iran. Especially the Revolutionary Guard units which are more than likely the best trained and best equipped in the region. Though with that said they can't take on the whole of the Middle East, their navy and air force isn't as capable as the rest of the Gulf states, which focus on a strong air force for defensive purposes. A question that is being asked in the international community is, how would Israel attack Iran or vice versa? 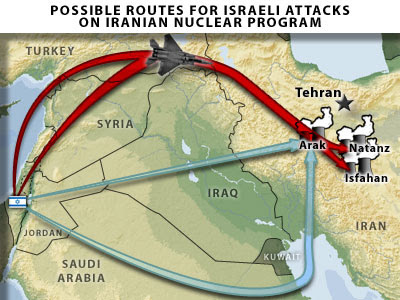 The shortest and easiest route is to go through Iraq and Syria and invade Israel, for Iran. But the Iraqis actually consenting to this; not about to happen after they fought a war against each other and general animosity. Or they simply invade Iraq also, which leads to war with Iraq; so this is off the table. Israel would do whatever it needed to attack Iranian nuclear sites; possibly flying over other nations, without warning or just warn the government of said nations. If they did warn the leaders of these nations the leaders would have a hard case to sell to their people; another air force just invaded our air space. Arab leaders are cheering for Israel to attack Iran, behind the scenes of course. They would publicly make noise how Israel shouldn't have done what it did, but the Arab world doesn't want Iran to have nuclear weapons. They can't attack Iran because their people would see it as an attack on fellow Muslims, a move that would look like siding with the Jews. Given the current state of affairs in Syria, the chances of Syrian forces actually being able to stop Israeli attack squadrons over their air space is pretty low. The Iraqis are still not capable of protecting their air space well enough to be a major concern, they are still rebuilding their military.